Test your knowledge of English language with this Word Brain Teaser. 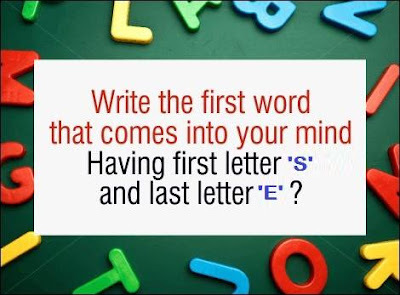 In this Word Brain Teaser your challenge is to write the first word which comes in your mind having first letter "S" and last letter "E". Write as many such words you can think within 60 seconds. Lets see how many words you can think in just 1 minute? How many such words you can think in one minute? There are many such words. A particular answer is put on hold to encourage discussion. Do write such words in comments section of this post.